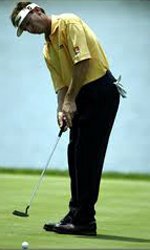 Brad Faxon - the best putter of all time? Golf's Best Putter: ... Brad Faxon? The words "Brad Faxon" and "great putter" will surely be mentioned synonymously well after his retirement. Faxon is known worldwide as one of the best 'pure putters' in golf history. Perhaps his best display of putting genius came in 2000 when he set the season record on the PGA Tour with just 1.704 putts per greens in regulation. So what is the secret that you can learn from Brad Faxon's putting? "My only secret is confidence" Faxon told said in an interview with Golf Digest in 2003. "I just try to hit every putt as if I've just made a million in a row." Of course a near perfect putting stroke is not something a player is born with. Faxon grew up playing at the Rhode Island Country Club, a Donald Ross course with small greens, thus forcing him to rely on his short game more than most. Though he admits his ball-striking has never been something which he would call a strength of his game, his sheer ability to deliver on the greens makes up for it dramatically. His reputation as an outstanding holer-out started right back in his college days and has never changed. Faxon has also always been a source of advice for many players on tour. In 2011 he shared a practice round with long hitter Gary Woodland, whom Faxon was shocked had no tour wins to his name at that point. After a trip to see Faxon to work on his short game, a win shortly followed, and they became regular practice partners after that. Faxon said of his work with Woodland: "I'm not a guy who has a method; I'm more about the complete picture. There are certain things I like to see in a guy's stroke, and he has a lot of those things." Perhaps one of the most astounding facts about Faxon's putting is that his statistics improved as he has got older. He himself puts this down to Scotty Cameron and the help they have provided with their facilities, and likes to think that his maintaining of standards throughout his career will be encouraging for other senior players. Faxon's key philosophy when it comes to putting is the mental acceptance of missing or making a putt. The ability to deal with whichever result will inevitably make you a more confident putter. For example, aiming a putt at the right edge of the hole that does not break left is not something that you should beat yourself up about when it doesn't break. Ultimately you did all you could do in terms of both process and execution. 1) Look at the hole while making practice strokes. Doing this makes you less stroke conscious and in turn more aware of where your target is. 2) The visual aspect of putting is a personal thing to everyone according to Faxon. His claim is that you don't have to hit a putt at a certain speed in order for it to go in. A caddie may see a variation of the line you see, plainly because you like to drop your putts into the hole rather than hit the back of the cup before dropping. 3) Trust your first instinct. Second guessing will only hinder your confidence as you will have two ideas confused before a putt is even struck.